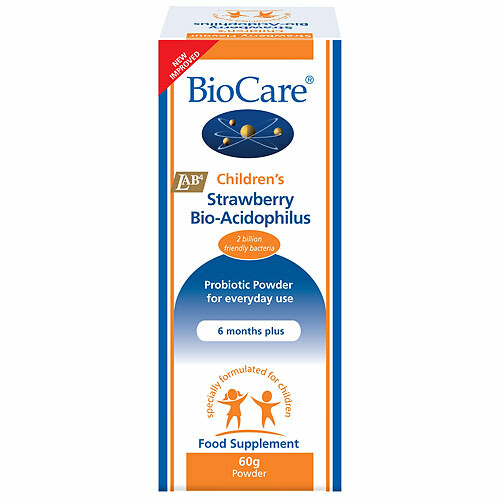 BioCare Children`s Strawberry Acidophilus provides lactobacillus acidophilus and bifidobacterium bifidum to maintain a healthy balance of intestinal microflora. Probiotic bacteria favourably alter the intestinal microflora balance, promote good digestion and boost immune function. Lactobacilli and bifidobacteria maintain a healthy balance of intestinal flora by producing organic compounds, such as lactic acid, hydrogen peroxide, and acetic acid. Fructooligosaccharides (F.O.S.) when ingested, provide a specific food source for the growth of friendly intestinal bacteria. Our digestive system is colonised by billions of bacteria and most of them are harmless. However, a favourable balance between the beneficial and the pathogenic bacteria must be kept to maintain a healthy system and its regular nature. To help safeguard this balance, the use of capsules containing beneficial bacteria such as Lactobacillus acidophilus and Bifidobacterium bifidum is now an established practice. 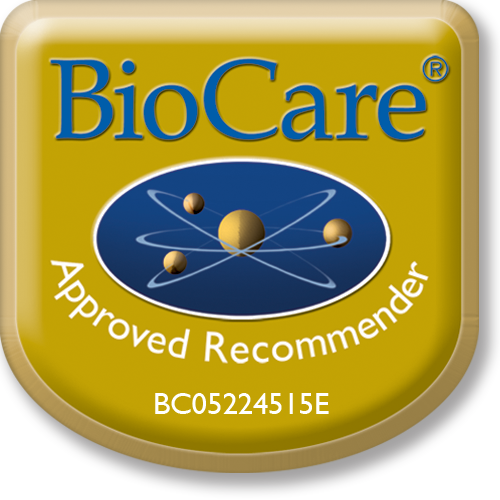 * Providing a total of 2 billion viable proprietary bacteria. Fructooligosaccharides (F.O.S. ), Potato Maltodextrin, Freeze Dried Strawberry Powder, Lactobacillus acidophilus, Bifidobacterium bifidum & Bifidobacterium lacti, Citric Acid. Children 6 months upwards: Take half a teaspoon in water, juice or milk or sprinkled onto food daily or as professionally directed. 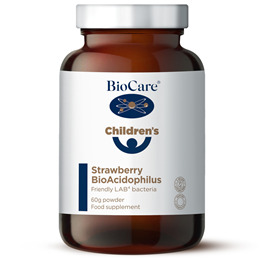 Below are reviews of Children`s Strawberry Bio-Acidophilus - 60g Powder by bodykind customers. If you have tried this product we'd love to hear what you think so please leave a review.